Limited Edition: 200 copies Worldwide. Notes: This Royal Mail set of stamps commemorates the historic landmark of Her Majesty Queen Elizabeth II becoming the longest reigning UK monarch, with Queen Victoria’s reign of 63 years and 216 days being exceeded by The Queen on 9th September 2015. These covers are hand made from the finest quality linen textured paper. Available in the Six-Reigns offer. The above Royal Mail Long to Reign Over Us: Miniature Sheet stamps were issued on 09 September 2015 by Royal Mail and feature the following stamp designs: 1st Queen Victoria City Medal; 1st Queen Elizabeth Wilding Portrait; 1st Machin new mauve colour; £1.52 The Windsor Crest; £1.52 Queen's Personal Emblem. 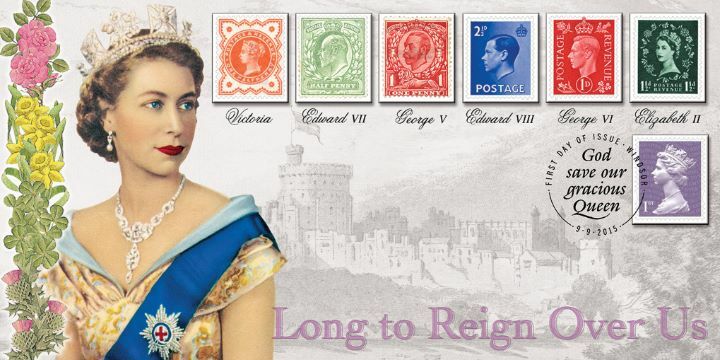 The Six Reigns Windsor Castle first day cover with the Windsor, God Save Our Gracious Queen, Special Handstamp postmark has been produced by Bradbury and features these stamps which can make a very collectible and lovely gift.